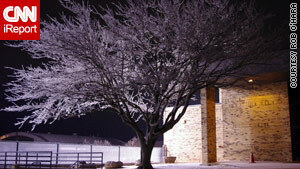 Snow and ice coated this tree in Yukon, Oklahoma, late last week. (CNN) -- Oklahoma's death toll for a winter storm that left thousands without power in the state climbed to three Sunday, emergency officials said. By mid-afternoon Sunday, 92,460 homes and businesses still were without power because of the storm, the Oklahoma Department of Emergency Management said. As ice melts, more temporary outages may happen as the ice's weight on power lines shifts and causes the wires to bounce, emergency management officials said. Police responded to 568 storm-related auto accidents in Oklahoma, and one of them resulted in the death of a 33-year-old man Sunday, officials said. A 73-year-old man died Saturday after his house caught fire when he used a wood-burning stove during a power outage. And a 70-year-old woman died Friday when a propane tank she was using to power her generator exploded, emergency management officials said. Oklahoma is under a state of emergency. The state's shelters accommodated 3,000 people Saturday. Much of the state will be under a freezing fog advisory from 9 p.m. Sunday until noon Monday, the National Weather Service said. The advisory signals that light ice accumulation from freezing fog is expected, and that visibility will be limited to a half-mile or less, the weather service said. The advisory extends into the Texas panhandle. The storm struck Friday, stretching from Oklahoma to eastern Tennessee and down to southern Mississippi, dropping snow, sleet and freezing drizzle or rain. The wintry weather moved east over the weekend, hitting several states, including the Carolinas and Virginia. In northern Georgia, 5,000 residents lost power when ice weighed down power lines, the Georgia Electric Membership Corp. said. The corporation said all of its customers had power restored by Sunday morning.